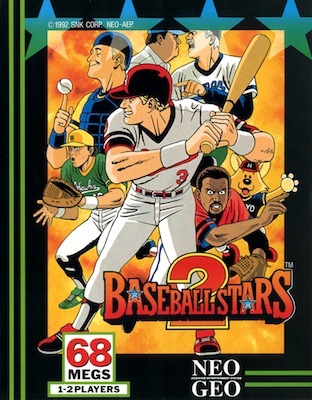 Bright colours, fast action and over-the-top in every-way, nothing better comes to mind on how to describe Baseball Stars 2. 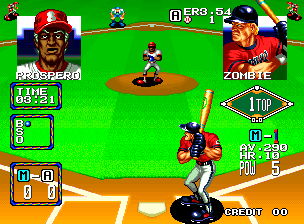 Having no MLB licensing your left with 12 teams with names like Aussie Thunder and Japan Samurai, which just suit the game’s style perfectly. You start out selecting to either take on a friend head-to-head, or taking on the 15 game season. You pick your team and try to take them to the top. You have two difficulty levels to choose that change which 6 teams you can choose from. The only other thing affected by the difficulty is automatic fielding which makes the game easier. Whether your batting or pitching, having control is what its about. This is done perfect, if only fielding was as easy. Batting is simple enough, with simply moving around the batters box with the D-pad. The simple choice of swing or bunt when you feel the pitch is perfect. If your going for a big hit you can get your powered-up bat for a bigger hit, giving a better chance towards getting a home run. Pitching has more to it, be it throwing hard and fast over the plate or using a deceptive slider all controlled with the direction on the D-pad making for a simple yet still complex control. Pitchers get puffed out as time goes on making them slow down, when they start to slow down its always a good time to switch out for one of your three back-up pitchers. Having the chance to hit the batter with the ball is always fun against a friend as well. Fielding isn’t that bad, its just that trying to see your fielders is the hard part as the screen never zooms out, leaving you with no idea of what position your fielders are in. Resulting in a strange mash of them just jittering around the field, trying to get one into view so they can get the ball. Colours that would make a pack of crayons feel ashamed of how dull they look, it catches your eye with a vivid tone and an art style to match, looking just how you would expect an arcade sport game, with big burly characters whose arms are bigger than their heads. Every time something big happens like fielders doing a diving catch or making a slide towards home base, it gives a few seconds of a much closer up detailed picture of what’s going on these add a lot to the game. 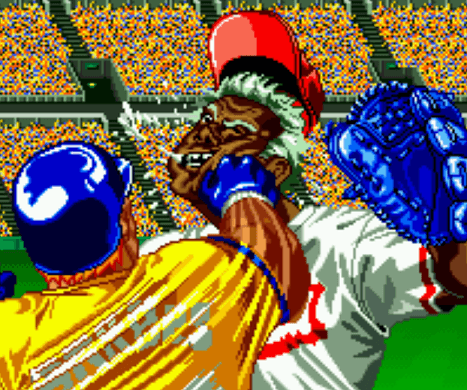 The greatest of them being when the batter gets beaned from the pitcher, he follows this up by running towards the mound giving you a close-up of the pitcher taking a right hook to the face. Listening to the early voice work can be a little rough but it still adds to the game as the commentator speaks about the match, along with the random amount of times he will just yell the name of the game out which will surly make you smile. The music that repeats in the background over and over gets old fast due too its short loop but at least it never hits the point of getting stuck in your head. 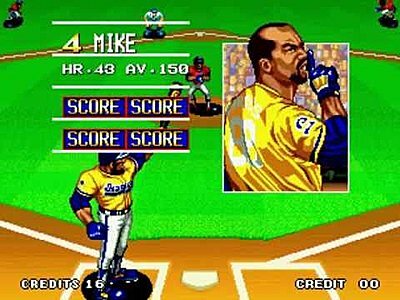 Arcade sports games always have great replay value. Even more if you have a second player around and this game is no exception. Its fast, over the top action and style gives a great twist on America’s favourite past time and laughs. With matches lasting around thirty minutes, you will definitely be coming back to this one a few times knowing just what to expect.